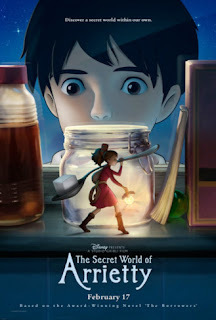 Released two years ago in its native Japan, THE SECRET WORLD OF ARRIETTY was a hit for first time director Hirosama Yonebayashi and Studio Ghibli. Yonebayashi previously worked as an animator on Ghibli's SPIRITED AWAY which was praised for its originality, and PONYO, which took five trophies at the 8th Annual Tokyo Anime Awards. The creators still have Manga on their minds, what with ARIETTY’s principal characters drawn with wide-open, saucer-shaped Western eyes and bodies that move with a pronounced, intriguing stutter. The effect will be familiar to those who grew up watching Japanese-derived cartoons like Voltron, Battle of the Planets, and Speed Racer. Mary Norton’s 1952 fantasy book about secret little people was previously adapted for the screen in the 1997 live-action comedy THE BORROWERS, starring John Goodman and Hugh Laurie. Ghibli’s new cartoon is humorous—but Yonebayashi doesn’t play the source material for laughs as much as tugs and tickles on the heartstrings. Disney must have appreciated the more thoughtful approach, snatching ARRIETTY for distribution in the U.K. and U.S., where Mouseketeers thankfully didn’t tinker with the property beyond overdubbing the dialogue in English. It’s the story of an unlikely friendship between two teenagers at a country home in Koganei, a village removed from the bustle and noise of the big city. The girl and boy have every reason to be curious about one another and explore each other’s worlds. Their bond has all the earmarks of true love, and under more ideal circumstances Cupid’s arrow would most certainly find its mark. Too bad the girl—at ten centimeters—is a veritable Thumbelina, living under the floorboards of the home belonging to Shawn’s aunt. The Clock family are “borrowers” who survive by gathering necessities from various rooms in the house of gigantic human “beans.” Pod is Arrietty’s no-nonsense father, a pragmatic, cautious fellow who provides for his brood by making nightly excursions into the colossal world above the floorboards. Homily is the worrisome mother, constantly fretting over Pod’s safety—and Arrietty’s too, after the Clock daughter takes her first foray into the land of giants. Wary of humans, the diminutive folk managed to stay hidden for years, even from their own kind. But things change when sickly Shawn arrives at the peaceful estate for some pre-op downtime; he’s scheduled for surgery and isn’t supposed to exert himself. We can tell Shawn is overjoyed when he accidentally spots Arrietty traipsing through the foliage in the yard, but (like Pod) the boy has learned to check his enthusiasm, his zeal replaced by fear. We’ve seen size-centric fantasies like this before in other fiction (Jonathan Swift’s Gulliver’s Travels and Lynne Reid Ranks’ The Indian in the Cupboard) and film—including FLUSHED AWAY, NIGHT AT THE SMITHSONIAN, and Disney’s own HONEY, I SHRUNK THE KIDS. But the Ghibli artists bring new perspective (pun intended) to the old David and Goliath formula, setting all the action either in the home or in the garden outside, where lustrous, colorful flowers dazzle the eyes like lilies in a Monet painting. Real-life comedy couple Will Arnett and Amy Poehler voice Pod and Homily, respectively. Arnett, the funnyman known for portraying obnoxious blowhards and oddballs (MONSTERS VS. ALIENS, BLADES OF GLORY), goes against type as pragmatic, soft-spoken Pod. Poehler, on the other hand, seems comfortable as the blathering, perpetually harried Homily. Carol Burnett brings duplicitous housekeeper Hara to life, alternately projecting concern for Shawn and disdain for the borrowers she believes still infest the house. Arrietty herself is voiced by 19-year old Bridget Mendler (Wizards of Waverly Place, Good Luck Charlie), who imbues the plucky pixie with sensitivity and wonder. One sympathizes with the tiny girl, who like most teens longs to venture further from the nest—but must learn first-hand of the dormant dangers (crows, rats, cats, exterminators, etc.) around her. The score (and singing) by French musician Cecile Corbel is lovely and unobtrusive, her instrumentation (koto, biwa, etc.) echoing the traditional sounds of the Far East. But the movie’s first act has nary any soundtrack at all, what with Yonebayashi devoting the aural space to an exploration of the natural (but seemingly amplified) noises surrounding Arrietty, like exploding raindrops and thunderous footfalls. The lack of technology in the Lilliputian Clock residence is puzzling. Pod can sew, weave baskets, and solder. He fashions grappling hooks out of thread and uses sticky-tape to scale walls and furniture, but apparently even the most intrepid borrower can’t be bothered with running his own electricity and plumbing. A doll house in the guest room where Shawn sleeps is tailor-made for the Clocks, right down to a working oven—but Pod insists they not use it or borrow any pint-size luxuries for fear of being discovered. They borrowers also lack scale model automobiles and telephones to travel and communicate with one another. Indeed, the protracted isolation leads Homily to believe the Clocks are the only borrowers left. The phenomenon troubled this writer if only because Arrietty’s people seem to share the same anatomy and brain capacity as their Brobdingnagian counterparts—namely, us. Yet instead of using their opposable thumbs and medulla oblongata to push geographic and intellectual boundaries, the Clocks live in a self-imposed exile where they must tip-toe around rats. When Shawn asks about Arrietty and her kind, she tells him they are borrowers, who take what they need from the humans. Granted, she uses the term “borrower” loosely, as the Clocks never actually return the purloined sugar cubes and tissue paper. Regardless, one would think the wee people would have more pride in themselves and hang their existence on something internal. Why not actualize your own potential rather than let your parasitism of others define you? Arrietty takes those first tiny steps here, and it’s an enjoyable, non-insulting trek for the whole family. Here’s hoping Ghibli tackles the other Borrower books in Norton’s series. 3 out of 4 stars.